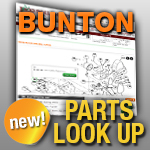 Bunton Wheels: Replace the loose wheel on your Bunton lawn mower with a new one from Jack’s. We can help get your mower moving properly again with a high quality replacement deck wheel or wheel assembly. Select the wheels you need below.